I wish the weather here in Los Angeles could make up its mind. The last few weeks have followed a trend of starting out warm and sunny and slowly progressing to a much colder, rainy state by the end of the week. It makes dressing in the morning somewhat of a challenge. To add to this dilemma, the weather never seems to be accurate on the "weather app" on my phone, which I often take a quick look at before making the final decision regarding what I am going to wear. If we can build cars that drive themselves, how long will it be until we can accurately predict the weather? Anyway, earlier this week I decided to wear this midi skirt from J. Crew that I love because I can wear it all year long and despite its busy pattern, it seems to go with everything. I went with stripes because it felt summery and perfect for the weather at the time, although it is now cooling down. It was quite bright out at the time so excuse my "squinty" stare! I would wear every single piece in this look! Gorgeous. Cobalt is my happy color, so I'm all over those shoes! Thank you! I also love cobalt, it goes so well with so many things regardless of the season! Thank you! I am still trying to get the hang of the whole pattern mixing thing! 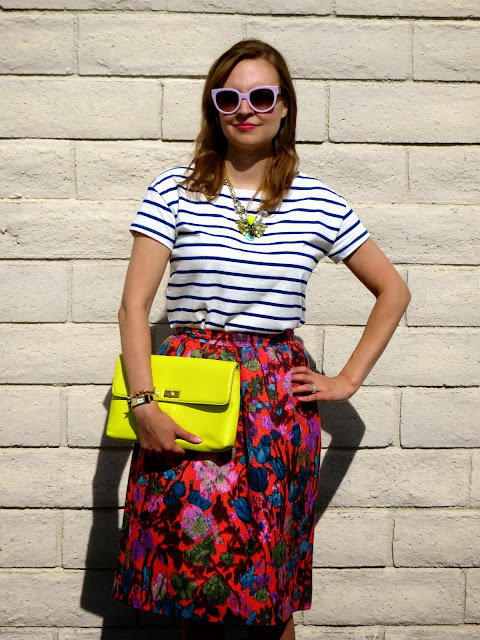 What a fun outfit, you are looking great :) Anything stripes for me is great and I love the mix with florals. Actually gotta find myself a tee, because right now I don't have one. Can you imagine? I have the opposite problem! I have too many striped tees! This one from H&M is great, it has sort of a loose fit that I like. Good luck tracking your perfect tee down! I am loving your pattern mixing, killer! 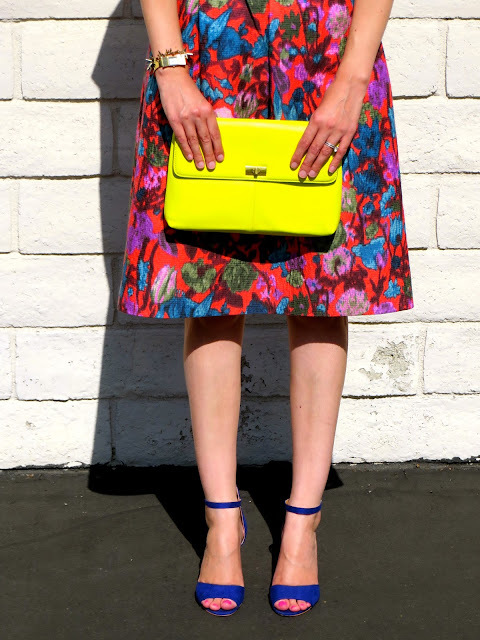 Very cute color and pattern mixing! Great styling! Thank you Grace! 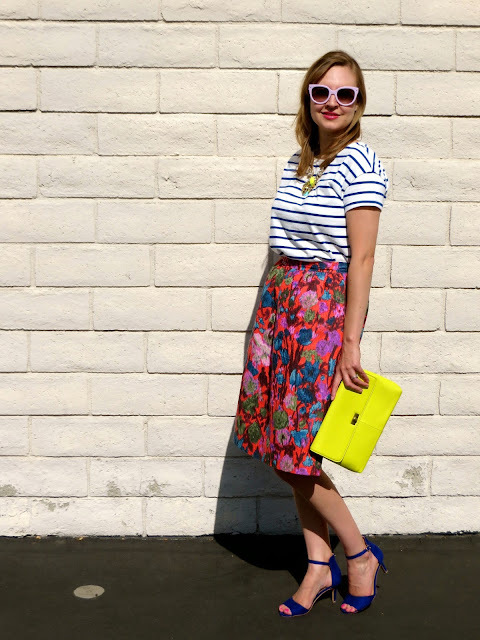 I love pairing this skirt with all sorts of things and it seems to lend itself nicely to pattern mixing. 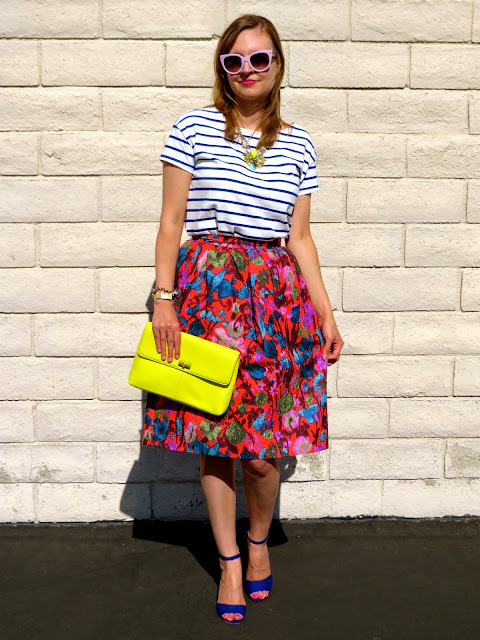 Stripes and floral look so great together! Love the bright colors! Thanks! Yes, I love the whole stripes and floral combo too! And of course color! Such a great look! Love the mix of patterns! you look great! your skirt is so gorgeous and I really like your shoes!